ithin an hour of its online debut, the number of viewers of Reza Aslan’s now notorious interview with Fox News’ Lauren Green had far exceeded the number of Israelites who crossed the Red Sea under the leadership of the father of all Jewish nationalist zealots, Moses. Aslan was being interviewed on the occasion of the appearance of his book that places Jesus of Nazareth at the top of a long list of subsequent, rabidly nationalist messianic Jewish zealots. By now, Aslan’s Zealot: The Life and Times of Jesus of Nazareth has come to dominate every book sales index in America, and his fifteen Fox-minutes of fame have been viewed by millions. Sales for this “scholarly” book have broken every record in the category of religious studies; the number of stops on Aslan’s current speaking tour is nothing short of staggering; and it will surely require a crack team of number-crunching accountants to calculate the tax debt on Aslan’s royalties and speaking fees. 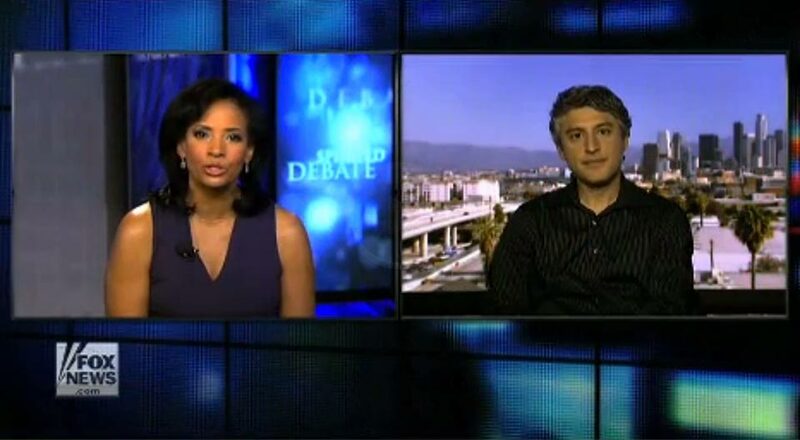 Reza Aslan on Fox News. To be sure, Aslan, 41, has been very hard at work since graduating college with a dazzling array of projects—mostly having to do with Islamic religion, culture, and literature as well as Middle Eastern politics—but none of which has anything to do with his quest for the historical Jesus. He is, to quote his own website, “the founder of AslanMedia.com, an online journal for news and entertainment about the Middle East and the world, and co-founder and Chief Creative Officer of BoomGen Studios, the premier entertainment brand for creative content from and about the Greater Middle East,” including comic books. Of his three graduate degrees, one is from the University of Iowa where he studied creative writing (the subject he actually teaches at the University of California, Riverside); the second was a two-year masters degree at the Harvard Divinity School, where he apparently concentrated on Islam; and his doctorate was not, as he indignantly told the hapless Green, in “the history of religions.” Rather, he wrote an exceedingly brief sociological study of “Global Jihadism as a Transnational Movement,” at UC Santa Barbara. Speaking on CNN in the wake of his Fox interview, Aslan ruefully observed, “There’s nothing more embarrassing than an academic having to trot out his credentials. I mean, you really come off as a jerk.” Actually, there is something significantly more embarrassing, and that is when the academic trots out a long list of exaggerated claims and inflated credentials. Perhaps it is Aslan’s general fondness for breathless, and often reckless, exaggeration that explains his problems with the basic digits and facts about his own work and life. Such hyperbole alas pervades Zealot. Depicting the religious mood of first-century Palestine early on in the book, Aslan asserts that there were “countless messianic pretenders” among the Jews (there were no more than an eminently countable half-dozen). Among his most glaring overestimations is Aslan’s problematic insistence that the foundational Christian belief about Jesus, namely that he was both human and divine, is “anathema to five thousand years of Jewish scripture, thought and theology.” The vast chronological amplification aside, Judaism’s doctrine about this matter is not nearly so simple, as Peter Schäfer demonstrated exhaustively in his very important study, The Jewish Jesus, and which Daniel Boyarin has argued even more forcefully in his latest book, The Jewish Gospels. Boyarin and Schäfer are just two of the many serious scholars whose works Aslan has clearly failed to consult. This combination of overly confident and simplistic assertions on exceedingly complex theological matters, with stretching of truths—numerical, historical, theological, and personal—permeates Aslan’s bestseller. And yet, precisely because Zealot is generating such frenzied controversy, this is all serving Aslan very well. But as it would be wrong to judge Aslan’s book by its coverage, let us turn to its text. Aslan’s entire book is, as it turns out, an ambitious and single-minded polemical counter-narrative to what he imagines is the New Testament’s portrayal of Jesus Christ. The core thesis of Zealot is that the “real” Jesus of Nazareth was an illiterate peasant from the Galilee who zealously, indeed monomaniacally, aspired to depose the Roman governor of Palestine and become the King of Israel. Aslan’s essentially political portrayal of Jesus thus hardly, if at all, resembles the depiction of the spiritual giant, indeed God incarnate, found in the Gospels and the letters of Paul. While Aslan spills much ink arguing his thesis, nothing he has to say is at all new or original. The scholarly quest for the historical Jesus, or the “Jewish Jesus,” has been engaged by hundreds of academics for the past quarter millennium and has produced a mountain of books and a vast body of serious scholarly debate. The only novelty in Aslan’s book is his relentlessly reductionist, simplistic, one-sided and often harshly polemical portrayal of Jesus as a radical, zealously nationalistic, and purely political figure. Anything beyond this that is reported by his apostles is, according to Aslan, Christological mythology, not history. The assassin elbows through the crowd, pushing close enough to Jonathan to reach out an invisible hand, to grasp the sacred vestments, to pull him away from the Temple guards and hold him in place just for an instant, long enough to unsheathe a short dagger and slide it across his throat. A different sort of sacrifice. There follows a vivid narration of the political tumult that had gripped Roman-occupied Palestine during the mid-first century, which Aslan employs to great effect in introducing readers to the bands of Jewish zealots who wreaked terror and havoc throughout Judea for almost a century. It seems like an odd way to open a book about the historical Jesus, who was crucified long before the Zealot party ever came into existence, until one catches on to what Aslan is attempting. The Prologue effectively associates Jesus, albeit as precursor, with that chillingly bloody murder by one of the many anonymous Jewish Zealots of first-century Palestine. Aslan’s entire book is, as it turns out, an ambitious and single-minded polemical counter-narrative to what he imagines is the New Testament’s portrayal of Jesus Christ. The strawman Jesus against whom he is arguing, however, is a purely heavenly creature, far closer to the solely and absolutely unearthly Christ of the 2nd-century heretic Marcion, than the exceedingly complex man/God depicted by the Evangelists and painstakingly developed in the theological works of the early Church Fathers. Aslan dismisses just about all of the New Testament’s accounts of the early life and teachings of Jesus prior to his “storming” of Jerusalem and his subsequent arrest and crucifixion. He goes so far as to insist that Jesus’s zealous assault on the Jerusalem Temple is the “singular fact that should color everything we read in the Gospels about the Messiah known as Jesus of Nazareth.” Everything! Aslan goes on to assert that the very fact of his crucifixion for the crime of sedition against the Roman state is “all one has to know about the historical Jesus.” Still, as the New Testament constitutes the principal primary source for these facts as well as for anything else we can know about the “life and times of Jesus,”Aslan has little choice but to rely rather heavily on certain, carefully selected New Testament narratives. Aslan is insistently oblivious even of the powerfully resonant climax to the single act of violence on the part of any of the twelve apostles recorded in the Gospels. The persistent problem permeating Aslan’s narrative is that he never provides his readers with so much as a hint of any method for separating fact from fiction in the Gospels, a challenge that has engaged actual scholars of the New Testament for the last two centuries. Nowhere does he explain, given his overall distrust of the Gospels as contrived at best and deliberately fictitious at worst, why he trusts anything at all recorded in the New Testament. But one needn’t struggle too hard to discern Aslan’s selection process: Whichever verses fit the central argument of his book, he accepts as historically valid. Everything else is summarily dismissed as apologetic theological rubbish of absolutely no historical worth. As with every criminal who hangs on a cross, Jesus is given a plaque, or titulus, detailing the crime for which he is being crucified. Jesus’s titulus reads KING OF THE JEWS. His crime: striving for kingly rule, sedition. And so, like every bandit and revolutionary, every rabble-rousing zealot and apocalyptic prophet who came before or after him— like Hezekiah and Judas, Theudas and Athronges, the Egyptian [sic] and the Samaritan [sic], Simon son of Giora and Simon son of Kochba, Jesus is executed for daring to claim the mantle of king and messiah. Aslan is particularly fond of assembling such lists of Jesus’s seditious predecessors, peers, and successors. Elsewhere, he compares Jesus’s mission to Elijah’s, which ended in his slaughter of the four hundred and fifty prophets of Baal; on another occasion he sets Jesus alongside Judas Maccabeus, who waged a long and bloody war against the Greek Seleucids. And Jesus is made out to be a direct forerunner of the militant rebel of the second century, Simon bar Kokhba, who battled the Romans to the goriest of ends. And so on. And in Mark’s version of the story, Jesus protests his peaceful intentions to those who come to seize him violently, crying out “Have you come out with swords and clubs to arrest me as though I were a bandit?” (Mark 14:48). Unsurprisingly, Aslan dismisses these passages as pure invention. One problem with this is that Aslan sometimes justifies his own selective acceptance of certain New Testament narratives by pointing to their appearance in all three of the synoptic Gospels which, he argues, lends them a degree of historical credibility. The Jesus actually depicted here is hardly prepping his “band of zealots” for a rebellion against Roman rule by strictly limiting their arsenal to two, obviously symbolic, swords. With the Temple in ruins and the Jewish religion made pariah, the Jews who followed Jesus as messiah had an easy decision to make: they could either maintain their cultic connection to their parent religion and thus share in [sic] Rome’s enmity, or they could divorce themselves from Judaism and transform their messiah from a fierce Jewish nationalist into a pacifistic preacher of good works whose kingdom was not of this world. Allergic to ambiguities or complexities of any kind that might interfere with his Manichean dichotomy between the historical Jesus of Nazareth and mythical Jesus Christ of the Gospels, Aslan perceives everything as an either/or proposition—either the zealous, radical, and purely political Jesus of history, or the entirely fictional moral teacher and pacifistic Jesus of Christology. He takes the same approach to the Jews of Jesus’s era: There existed either the violent apocalyptic Jewish bandits who mounted one rebellion after another against the Romans, or the corrupt quisling Priests, such as Caiaphas who suppressed all such activity. The passive, scholarly Pharisees who opposed both these postures, are simply ignored. To be clear, Jesus was not a member of the zealot party that launched the war with Rome because no such party could be said to exist for another thirty years after his death. Nor was Jesus a violent revolutionary bent on armed rebellion, though his views on violence were far more complex than it is often assumed. And yet, elsewhere Aslan insists, that being “no fool,” Jesus “understood what every other claimant to the mantle of messiah understood: God’s sovereignty could not be established except through force.” And it is this latter characterization which is central to Zealot. There is not so much as an allusion to be found in Zealot to the fascinating debates between Jesus and the Pharisees about the specifics of Jewish law, such as the permissibility of divorce, the proper observance of the Sabbath, the requirement to wash one’s hands before eating, the dietary laws, and—most fascinating and repercussive of all—the correct understanding of the concept of resurrection, in response to a challenge by the Sadducees who rejected that doctrine tout-court. Aslan is intent on portraying Jesus as a faithful, Torah-abiding Jew for obvious reasons: Intent on being crowned King of Israel, and as such a candidate for the highest Jewish political office, how could he be anything less than a “Torah-true” Jew? So Aslan takes at face value the Gospel’s report (Matthew 5:7) of Jesus’s insistence that he has not come to undermine a single law of the Torah, but rather to affirm its every ordinance. Aslan’s ignorance—if that is what it is—has serious consequences. Aslan achieves the two central goals of his book with this distorted, and terribly unflattering, depiction of the treatment he alleges Jewish law demands of the foreigner. It at once hardens his argument about Jesus’s “fierce nationalism,” while at the same time creating an image of the Jews as a hateful bunch, profoundly intolerant of the mere presence of others in their land. It is difficult when reading this, and many similar blatant distortions, to suppress all suspicion of a political agenda lying just beneath the surface of Aslan’s narrative. What will prove most shocking, at least to those with some very basic Jewish education, are Aslan’s many distorted, or plainly ignorant, portrayals of both the Jews and their religion in Jesus’s day. Aside from his apparent unfamiliarity with the critically important recent works of Schäfer and Boyarin, Aslan seems oblivious of more than a century of scholarship on the exceedingly complex theological relationship between the earliest disciples of Jesus and the early rabbis. The foundational work of R. Travers Herford in Christianity in Talmud and Midrash (1903) and, three-quarters of a century later, Alan Segal’s Two Powers in Heaven: Early Rabbinic Reports about Christianity and Gnosticism (1977) are just two of the hundreds of vitally important books missing from his bibliography. This ignorance—if that is what it is—has serious consequences. For it is not only the Gospels’ accounts of Jesus citing Hebrew Scriptures while discussing Jewish law that belie Aslan’s portrait of Jesus and his apostles as an uncouth band of Galilean peasants. As Schäfer has richly documented, Rabbinic sources contain numerous references to the original biblical exegesis of Jesus and his disciples, including accounts of rabbis who were attracted to these interpretations, even as they came ultimately to regret and repent of their “heresy.” That Aslan has not read Schäfer is made most painfully clear in his pat dismissal of the Roman historian Celsus’s report of having overheard a Jew declare that Jesus’s real father was not the Jew, Joseph, but rather a Roman centurion named Panthera. Aslan says that this is too scurrilous to be taken seriously. While it would be unfair to expect him to be familiar with the common Yiddish designation of Jesus as Yoshke-Pandre (Yeshua, son of Panthera), one might expect him to have read the fascinating chapter devoted to this very familiar and well-attested theme in rabbinic sources, in Schäfer’s Jesus in the Talmud. On the other hand, Aslan weirdly accepts at face value, and even embellishes, the dramatic accounts in the Gospels of Jesus’s entry into Jerusalem allegedly just before the Passover, as the Jewish crowds wave palm branches and chant hosannas. But were he familiar with the basic rituals of the Sukkot festival, Aslan might somewhere have acknowledged the skepticism expressed by many scholars about the Gospels’ contrived timing of this dramatic event to coincide with Passover. I will spare readers a long list of Aslan’s blatant and egregious errors regarding Judaism, from his misunderstanding of the rabbinic epithet Am Ha-Aretz (the rabbinic description, fittingly enough, of an ignoramus) to his truly shocking assertion that rabbinic sources attest to Judaism’s practice of crucifixion. Aslan very effectively explains why the Romans employed crucifixion to such great effect; the horrific public spectacle of the corpses of those condemned for their sedition to this most agonizing of deaths was a powerful deterrent to would-be insurrectionists. However, he seems not to understand how particularly offensive this was to the Jews, whose Torah demanded the immediate burial of executed criminals (who were to be hanged, never crucified), prohibiting their corpses to linger “even unto the morning” as this was considered a desecration of the divine image in which all men were created. Finally, there is Aslan’s description of the fate of the Jews and Judaism in the wake of the destruction of the Temple. In his account, all of the Jews were exiled from Judea, and not so much of a trace of Judaism was allowed to survive in the Holy Land after 70 C.E.. Astonishingly enough, Aslan says not a word about the tremendously important armistice arranged between the pacifistic party of Jewish moderates led by Yochanan ben Zakai, or of the academy he established at Yavneh (Jabne, or Jamnia) some forty miles northwest of Jerusalem, and which flourished for more than a half-century, breathing new life and vitality into rabbinic Judaism in the immediate aftermath of the destruction of Jerusalem. Readers with no background in the history of rabbinic Judaism will be misled by Aslan to believe that its pacification was the result of the Jews total defeat and expulsion from Palestine. Aslan seems to think that rabbinic Judaism is entirely a product of diaspora Jews who, only many decades after the Temple’s destruction, began to develop a less virulently and racist version of the Jewish religion, centered on Torah study. Can it be that this self-professed “historian of religions” is entirely ignorant of the Sages of the Land of Israel who flourished in the wake of the destruction of the Temple, and whose teachings are recorded in the Mishnah, and later the Jerusalem Talmud? Or is Aslan, here again, choosing deliberately to ignore inconvenient historical truths? And none is less convenient than the fact that a significant, and ultimately dominant, faction of Jews of first-century Palestine, far from being nationalist zealots, were pacifists whose accord with Vespasian gave birth to the religion we today recognize as Judaism. Today, I can confidently say that two decades of rigorous academic research into the origins of Christianity have made me a more genuinely committed disciple of Jesus of Nazareth than I ever was of Jesus Christ. This unsubtle suggestion that Evangelical Christians’ discipleship and knowledge of Jesus is inferior to his own makes it rather harder to sympathize with him as an entirely innocent victim of unprovoked, ad hominem challenges regarding his book’s possibly Islamist agenda. Aslan had to know that opening a book that portrays Jesus as an illiterate zealot and which repeatedly demeans the Gospels with a spiritual autobiography that concludes by belittling his earlier faith as an Evangelical Christian would prove deeply insulting to believing Christians. Finally, is Aslan’s insistence on the essential “Jewishness” of both Jesus and his zealous political program not also a way of suggesting that Judaism and Jesus, no less than Islam and Mohammed, are religions and prophets that share a similarly sordid history of political violence; that the messianic peasant-zealot from Nazareth was a man no more literate and no less violent than the prophet Mohammed? Allan Nadler is professor of Religious Studies and director of Jewish Studies at Drew University. This year, he is Visiting Professor of Jewish Studies at McGill University and rabbi of Congregation Beth El in Montreal, Canada. He is currently writing a book on the history of heresy in Jewish thought for Princeton University Press. Excellent piece. I would only add that the author unfortunately reinforces Aslan's error of referring to "first-century Palestine." The Romans (later, Byzantines) did not refer to the area as Syria Palestina until well after the time of Jesus. I am an academic but certainly not a scholar of religious studies by any stretch. Having strayed from my Roman Catholic roots, I am slowly working my way back to renew my relationship. Books by Aslan and others and reviews such as provided by Dr. Nadler certainly have given me a variety of views to consider. I would have found extremely helpful in Dr. Nadler's criticism some additional details about some of Aslan's comments: "Any Gospel verse that might complicate, let alone undermine, Aslan’s amazing account, he insolently dismisses as “ridiculous,” “absurd,” “preposterous,” “fanciful,” “fictional,” “fabulous concoction,” or just “patently impossible.” How specifically were these descriptors off target? Whatever Aslan's faults, and I am sure they are many whereas he is hardly original, Nadler too has much fact-checking to do. Imagine this mistake on his part: "the historical Jesus, who was crucified long before the Zealot party ever came into existence"
If so, then why is one of Jesus' followers called Simon the Zealot? [Matt. 10:4]. In response to eil100's query, which indeed "imagines" my "mistake": It doesn't require "much fact-checking" (in fact in requires almost none at all) to know that the Zealot (upper-case) party, namely the adherents of what Josephus termed the "Fourth Philosophy" emerged in the context of the Jewish rebellion against Roman rule during the 7th decade, CE. Most scholars identify Judah of Gaulanitis as the founder of the Zealot Party. The adjective zealot (kana'i in Hebrew) to depict one who is zealous for the honor of God is as ancient as the Torah's account of Pinchas the zealot (see Numbers, 25:6-12), it has nothing to do with this militant party, and was not uncommonly used as a term of praise for especially, or "zealously," pious Jews, such as Simon the Zealot. This was a wonderfully researched and written article. My fault is being shamelessly bemused by mythologies, thanks to the likes of Joseph Campbell. Either way, Ms. Green is clearly an idiot, and by the same token Mr. Aslan is clearly a fake. I believe the interview, which I don't wish to see in it's entirety, was a plant that Fox easily fell for. Could we expect anything less, from either side? And here ARE two sides. In closing, is there a Christian fatāwā on Aslan's life? I doubt it. And that, my friends, is the difference. Not all Muslims believe that fatāwās are appropriate. Besides, conservative Christians have just handed the job over to God: they believe in being kind even to non-Christians but, later, during the Judgment, if a person doesn't accept J.C. as their Lord and Savior, they'll be condemned. Leave the dirty work to the Boss. As a former evangelical Christian, the historic Jesus I encountered in my university days was extremely fascinating. Unfortunately I was studying Canadian History and English Lit...so I did not have too much time available for Jesus. Any books easily read by a lay person on the topic of the historical Jesus? I'm not sure I have the chops for Schafer's books at the moment. 'Did Jesus Exist? :The Historical Argument for Jesus of Nazareth,' by Bart D. Ehrman, is a good one. Alas, I fear that Ehrman's tome on this topic is no better than Aslan's efforts on his topic. Ehrman has written a number of excellent books for the general reader. This isn't one of them. I have read much of Bart Ehrman's work but not "Did Jesus Exist? :The Historical Argument for Jesus of Nazareth." However, I follow his blog, "Christianity in Antiquity" which has much fascinating material in it (there's a cost of about $25/yr. which all goes to charities). His Great Courses lectures (I prefer CD's), "The Historical Jesus" and "The New Testament," are excellent. "If so, then why is one of Jesus' followers called Simon the Zealot? " Pinchas, in the Old Testament, is also called Zealot. Are you suggesting that he too was a member of the Zealot party? Background on the use of the Hebrew term "zealot" (kanai) would be useful. Thanks to JRB and Dr. Nadler for this article and for the references, some of which I haven't seen before (and thanks for y2bloch for his input on calling the area "Palestine," a common error that can have political implications itself). This is the most thorough review of "Zealot" I've seen so far. Adam Kirsch, writing for Tablet, praised the book as giving a powerful portrait of Jesus, and Adam Gopnik, of The New Yorker, thought Aslan's book not out of the ordinary as far as portraits of the historical Jesus go. I also saw an early First Things piece in which the reviewer took issue with Aslan's credentials but said he wouldn't deign to read his book. I'd like to see even more discussion and detail. I would have found it very useful if Professor Nadler had included references to Geza Vermes and his studies on: the historical Jesus in the context and society of his time. Perhaps Professor Nadler would consider appending his thoughts on this subject re the studies of the late Professor Vermes. A serious take-down, with a real zinger at the end: Aslan as the Manchurian, nay, the Babylonian Candidate, manipulating the manipulators on Fox. The sad thing is that public life becomes viewed as a transgression by real scholars, and so along with their criticism of popular writers they relinquish their own responsibility, and possibility, to become an engaging public voice. Bravo to Professor Nadler for publishing a response in the Jewish Review. I am not suggesting he should go on Fox, but it would be nice to give Aslan credit for bringing attention to alternative readings of Jesus, and for fostering a public dialogue on this subject, as confounded as it might sometimes be. thanks for an interesting, educating article. i'm going to the library to check out Schafer, Boyarin, Segal and Herford. and Celsus if i can find him. As a Catholic, I am indebted to Nadler's beautiful analysis of Aslan's book, showing his bias and rejection of Jesus's spiritualism and peace fullness. 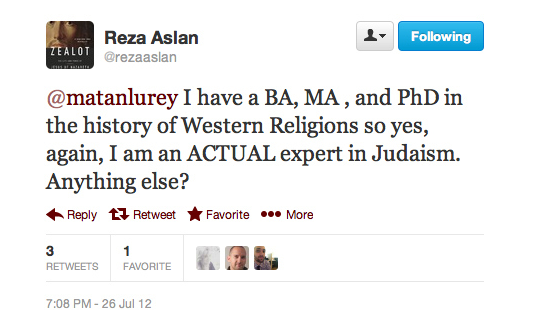 Oh, and how does a doctrinal program make a non-Jew an expert on Jewish religion and history? Aside from those quibbles, Dr. Nadler, how did you like the book? The argument that Jesus lived and preached as a Pharisee rabbi—without the slightest intention of founding a new religion—has been made lucidly in a series of books by Hyam Maccoby, formerly the Librarian and a Fellow of the Leo Baeck Institute in London. His background as a Talmudic scholar and his depth of knowledge of the primary languages involved first century studies gave him the wherewithal to analyze Paul's writings and to clearly demonstrate Paul's superficial knowledge of Biblical Hebrew and his ignorance of the subtleties of Talmudic argumentation. His argument that Paul was a converted pagan who created a new religion that appropriated Jesus for purposes that were never remotely his own is made with a methodological sophistication that will satisfy the most scrupulous reader. The point of entry into Maccoby's treatment of these themes is: "The Mythmaker: Paul and the Invention of Christianity." I was surprised at the naivety of Dr. Nadler's essay. He is truly ignorant of a very substantial line of thinking that depicts Jesus as a Jewish nationalist zealot, or at least, sympathetic to Israel's struggle to free itself from Roman rule. Perhaps the best and most scholarly representative work along these lines is that of Dr. S.G. F.Brandon, a British scholar of Christianity's origins. His two books, Jesus and the Zealots, and The Fall of Jerusalem and the Rise of the Christian Church are required reading for anyone wishing to find out more about the enigmatic person, Jesus of Nazareth. Where Aslan goes wrong is in trivializing Jesus as an ignorant peasant, and not as a shrewd judge of men. Jesus was a proud Jew, worthy of emulation along such lines. Nothing in his earthly life suggested that he intended to found a gentile mystery-cult religion; that job was left to Paul. I am not a scholar but a student of the Bible which I believe beyond a doubt to be the Word of God. Thanks first of all to Dr. Nadler for his insightful review of this book which was written by an obvious unbeliever who calls himself a one time Christian and a scholar of the New Testament and repeatedly flaunts on TV so arrogantly his "PhD". Let me say I haven't yet read this book but intend to soon. But I would be interested to know what Reza Aslan has to say about what the Bible says about him and his kind which have been around for quite some time, especially in 1 John 2 and verses 18 following. Mr. Trott, are you one of those Christians who makes a distinction between the wisdom of God and the wisdom of man? If so, please recognize that the Bible never claims to be the Word of God (2 Timothy doesn't count for a number of reasons), never claims to be inerrant or without internal contradiction and never claims that it should be understood literally as thoroughly historical. Even if it did, one would have to examine to see if any of these claims were true. That it is the Word of God is a claim humans make--part of the so-called wisdom of man. I have never made a scholarly study of religion, but as a granddaughter of a former Presiding Bishop of the Episcopal Church, and a free-thinker since age ten who studied the Bible in an Episcopal high school and classical languages and ancient cultures and history as electives in college, I have long been fascinated by and pondered the concept of religious belief and its effect on civilizations and individuals. I could not help when reading this book but assume the author's agenda was to skew the non-Muslim public's view of early Judeo-Christian principles, in particular the zenophobia and encouragement of violence, by essentially equating them to the teachings in the Koran, thus correcting what he may feel is an unjustified bias against his religion. I will be curious to hear whether the members of my bookclub, whom I host tomorrow to discuss this book, were immediately struck by the author's lack of scholarly objectivity as was I. This was by far, one of the best reviews I've read on this book. Thank you for writing it! You are a scholar and a gentleman! Prof. Nadler: The number of viewers of Reza Aslan’s Fox News’ interview had far exceeded the number of Israelites who crossed the Red Sea under Moses. Steefen: Professor Nadler should use the scholarly name of the sea: the Reed Sea. It does not serve the needs of raising the standards of religious education to mislead people into even thinking God parted the waters of the Red Sea or the Gulf of Suez. Steefen: What vast chronological amplification? http://www.hebcal.com/converter/ gives us a Hebrew year of 5774. The Jewish Jesus by Peter Schafer came out in hardcover 2/26/2012 (Kindle version seems to be the same date). Zealot came out 7/16/2013. If Zealot’s manuscript deadline was 7/16/2012 maybe he could have read Schafer’s book and incorporated it into his manuscript’s final draft—a hard thing to do if Schafer’s arguments weren’t in the shaping of previous manuscript drafts. The Jewish Gospels: The Story of the Jewish Christ by Daniel Boyarin, copyrighted 2012 but amazon.com is only showing a reprint edition of August 6, 2013--after Zealot came out. Prof. Nadler’s claim that Aslan should have read and incorporated these books into his manuscript is invalid. By the way, did any of these books win an award or make the cover of a scholarly Journal to catch Aslan’s attention? Was there some fantastic book tour for either Schafer or Boyarin? Prof. Nadler: The book’s Prologue is both titillating and bizarre. Entitled “A Different Sort of Sacrifice” it opens with a breezy depiction of the rites of the Jerusalem Temple, but very quickly descends to its ominously dark denouement: the assassination of the High Priest, Jonathan ben Ananus, on the Day of Atonement, 56 C.E., more than two decades after Jesus’s death. Steefen: It’s bizarre for me because the Revolt action is more than 5 years away. It may be more than 20 years after the biblical Jesus but less than 10 years from the death of Mother and Child, Queen Helena and King Izates, who fed 5,000 plus during the famine circa 47 C.E. Mary was holy: Queen Helena was holy. Jesus was the only begotten son: King Izates was called his father’s only begotten son. Prof. Nadler: To address the obvious problem that the Jesus depicted in Christian Scriptures is the antithesis of a zealously political, let alone ignorant and illiterate, peasant rebel and bandit, Aslan deploys a rich arsenal of insults to dismiss any New Testament narrative that runs counter to his image of Jesus as a guerilla leader, who gathered and led a “corps” of fellow “bandits” through the back roads of the Galilee on their way to mount a surprise insurrection against Rome and its Priestly lackeys in Jerusalem. Steefen: Jesus was asking for trouble with his carefully staged Palm Sunday conspicuous entrance into Jerusalem. The high priest’s Passover garments were held by Rome, distributed by Rome, and returned to Rome for safekeeping. The turning over of the tables was an act against Rome. Steefen: LOL. Jesus delivers a parable that ends with: those who did not want me king, bring them and slay them before me. Jesus delivers another parable in which a king’s messenger is killed. The king not only kills the murderers but burns down the hometown of the murders thereby harming innocent women, children, and men. Prof. Nadler: There is not so much as an allusion to be found in Zealot to the fascinating debates between Jesus and the Pharisees about the specifics of Jewish law, such as the permissibility of divorce, the proper observance of the Sabbath, the requirement to wash one’s hands before eating, the dietary laws, and—most fascinating and repercussive of all—the correct understanding of the concept of resurrection, in response to a challenge by the Sadducees who rejected that doctrine tout-court. Steefen: Dr. Nadler believes Jesus must have been an educated man. Here he opposes not only Aslan but Bart Ehrman as well. I agree Jesus was an educated man. Prof. Nadler: What will prove most shocking, at least to those with some very basic Jewish education, are Aslan’s many distorted, or plainly ignorant, portrayals of both the Jews and their religion in Jesus’s day. Aside from his apparent unfamiliarity with the critically important recent works of Schäfer and Boyarin, Aslan seems oblivious of more than a century of scholarship on the exceedingly complex theological relationship between the earliest disciples of Jesus and the early rabbis. The foundational work of R. Travers Herford in Christianity in Talmud and Midrash (1903) and, three-quarters of a century later, Alan Segal’s Two Powers in Heaven: Early Rabbinic Reports about Christianity and Gnosticism (1977) are just two of the hundreds of vitally important books missing from his bibliography. Steefen: I’ve read Jesus in the Talmud by Schafer. (I gave it 3 out of 5 stars.) I have not yet read Christianity in Talmud and Midrash (1903). I have not read Two Powers in Heaven: Early Rabbinic Reports about Christianity and Gnosticism (1977). Prof. Nadler: That Aslan has not read Schäfer is made most painfully clear in his pat dismissal of the Roman historian Celsus’s report of having overheard a Jew declare that Jesus’s real father was not the Jew, Joseph, but rather a Roman centurion named Panthera. Aslan says that this is too scurrilous to be taken seriously. While it would be unfair to expect him to be familiar with the common Yiddish designation of Jesus as Yoshke-Pandre (Yeshua, son of Panthera), one might expect him to have read the fascinating chapter devoted to this very familiar and well-attested theme in rabbinic sources, in Schäfer’s Jesus in the Talmud. Steefen: Your claim that Aslan should have read the book is invalid as explained above. Second, please explain how a Roman paternity and Roman citizenship while one is Jewish through a Jewish mother. Prof. Nadler: On the other hand, Aslan weirdly accepts at face value, and even embellishes, the dramatic accounts in the Gospels of Jesus’s entry into Jerusalem allegedly just before the Passover, as the Jewish crowds wave palm branches and chant hosannas. But were he familiar with the basic rituals of the Sukkot festival, Aslan might somewhere have acknowledged the skepticism expressed by many scholars about the Gospels’ contrived timing of this dramatic event to coincide with Passover. Prof. Nadler: to his truly shocking assertion that rabbinic sources attest to Judaism’s practice of crucifixion. Prof. Nadler: Finally, there is Aslan’s description of the fate of the Jews and Judaism in the wake of the destruction of the Temple. In his account, all of the Jews were exiled from Judea, and not so much of a trace of Judaism was allowed to survive in the Holy Land after 70 C.E.. Astonishingly enough, Aslan says not a word about the tremendously important armistice arranged between the pacifistic party of Jewish moderates led by Yochanan ben Zakai, or of the academy he established at Yavneh (Jabne, or Jamnia) some forty miles northwest of Jerusalem, and which flourished for more than a half-century, breathing new life and vitality into rabbinic Judaism in the immediate aftermath of the destruction of Jerusalem. And none is less convenient than the fact that a significant, and ultimately dominant, faction of Jews of first-century Palestine, far from being nationalist zealots, were pacifists whose accord with Vespasian gave birth to the religion we today recognize as Judaism. Rabbi Simeon ben Lakish said: Woe unto "him who makes himself alive by the name of god." Rabbi Johanan (ben Zakkai) replied: Woe to the nation that attempting to hinder the Holy One when he accomplishes the redemption of his children: who would throw his garment between a lion and a lioness when these are copulating? Ralph Ellis in his book King Jesus: From Egypt (Kam) to Camelot (Chapter 10: Saul-Josephus and Modern Judaism) says: This extract says that Rabbi Lakish condemns "the one who resurrects himself by the name of god." This is actually a coded reference to Jesus and the Talmudic notes confirms this. So, Vespasian gives Josephus and Rabbi Johanan land on the plains outside of Jerusalem. The former has the Testimonium Flavianum (once thought to be a later insert) but the latter also defends an important part of the Gospel story. (1) We only got the tora 4,400 years a (or 2,400 years before Christianity). Not 5,000. At the time homo sapiens had only been in existence for 3,700 years according to Jewish tradition. (2) As for Boyarin etc., how did Dr. Nadler know of them? hwo do I know of them? I'm not a man who has spent 20 years researching Christianity--I'm an Orthodox Jew with a full-time job and a family. And I know how to use Google. The point is this guy is a fraud. And you don't need this Schafer guy to tell you that the Talmud in a few places tells us that J was the son of a Roman named Pantera or Pandera (obviously the same person mentioned by Celsus). What is your question about paternity? You mean that this yeshu character should have been called to the tora as yeshu ben avraham? I mean obviously we believe he was Jewish,. but because he was a heretic and he had a Roman dad, we insult him by reminding him that his dad wasn't Jewish. Nothing complicated. (3) As to your odd non sequitur at the end, I couldn't find the language you state in the text, but that's nice that someone named Ralph Ellis is now interpreting the Talmud. And the Testimonium Flavianum as it appears in most versions of Josephus was pobviolsy an insert. He tell us he was a Pharisee--wouldn't be calling anybody the son of hashem. It makes sens he'd mention J though, and he probably did in some stripped down version. (4) As to explaining sukot vs. pesakh. On sukot we wave palm fronds and shout hosannas (hosannas specifically on hoshana raba--second-to-last day of sukot. So to the extent there's any historical accuracy in the NT (an issue brought up by Dr. Nadler) that scene obviously happened at sukot and was transposed to pesakh to allow for the whole rebirth theme (Spring and the Exodus etc.). (5) What on earth are is the high priest's Passover clothing? And why would he keep them in Rome? Do you know how far away Rome is/was? Lots more--let me know if you're interested. As a nominal Christian/borderline Agnostic the nuances of the article and the preceding posts are a little over my head though all very interesting. The number of Christian/Jewish/Muslim sects would seem to indicate there seems to be quite a bit of room for interpretation. However I would be interested to know where Jesus was born. As I finished reading 'Zealot' I naturaly wanted to learn Jewish reaction to the book. It seems to me that the only historically valid approach to understading Jesus is the one adopted by Aslan--which is of course through the filter of 1st century Judaism. In this respect, I thought the book was quite worthwhile. As an athiest, I couldn't help reading a strong subtext in the telling of how Christianity "divorced" (to use Aslan's term)itself from Judaism--in order to survive/thrive. You can almost make an argument that the Gospels in the New Testament (specifically James)point directly to the invention of anti-semitism. It certainly clarified for me the numerous claims of fault attributed to Jews--that still persist to this day. Thank you, Alan Nadler, for this excellent critique of Aslan's popular book. Your assertion that his method of determining the historical accuracy of Gospel statements , "Whichever verses fit the central argument of his book, he accepts as historically valid," is totally right on. Aslan's ZEALOT is a page-turner authored by a professor of creative writing. As such, it was a fun read. It is tragic, however, for lay people to read it and not weigh it against other, more scholarly, works. I like Marcus Borg and Burtan Mack, for instance. But, Jesus lived so long ago that the search for the historic/Jewish Jesus must forever remain just that--a search! You cannot imagine how dismayed I am at the scurrilous attack by Nadler on Aslan's book. Nadler displays a zealous revisionism to the mainstream scholarship of the last 50 years on the personality of the Jew Jesus. He thus demonstrates his complete ignorance of Josephus, the Targums, the Dead Sea Scrolls and the works of Geza Vermes and Hyam Maccoby, inter alia. His reliance on the Talmud accounts of Jesus is mistaken, since everyone acknowledges that the Jesus portrayed there lived 150 years before Jesus of Nazareth. Nadler's reference to Boyarin and other so-called scholars of similar ilk clearly indicate in no uncertain terms his predilection for sensationalist Second Temple fabrications of history and text. The very fact that the New Testament Gospels were written almost 100 years after Jesus died and under Roman occupation of Asia Minor and the Holy Land is proof positive their authors were scrupulously aware of the need not to offend Rome in any way. That is why the Gospels erase all references to the Roman occupation of Judea and Galilee, its savage persecution of the Jews and the fact that Jesus was a Pharisee himself. In other words, Rome is the good guy, the Jews are the bad guys. The fact that Nadler deliberately ignores the historical background of Jesus' life is an indicator of his distorting lens he brings to bear on the New Testament writers. He also ignores the fact that there were other Gospels written about Jesus the Zealot which were suppressed by the Roman-dominated Gentilized Church. Finally, where does Nadler get off with his insulting ad hominem attacks on Aslan which border on slander? And where in heaven's name did Nadler ever come to the conclusion that the New Testament portrays Jesus as a pacifist? Jesus was a violent man, he said he came to bring the sword into the world, not peace, he attacked the money-changers in the Temple courtyard who were there to facilitate, after all, the purchases of offerings by pilgrims. Moreover, his cruel streak led him to deny he had a mother and to dismiss her and his family from his sermons. He also refused to offer help to a Lebanese woman. This is all plainly stated in the Christian Bible. shame on the Jewish Review of Books for publishing Nadler's long and libelous diatribe. The Gospels were not written "almost 100 years after Jesus died" but between 70 & 95-100 CE--that is, between 40 to 70 years after Jesus. It's tiresome reading yet again selected verses to prove a general point: Jesus is portrayed as having made remarks and having done things that exuded cruelty and as saying and doing things that exuded compassion. It's a mix in the Tanakh too. Thank you so much for your insightful review. I had no idea about this truly unbelievable interview, but certainly I couldn't agree more with your analysis of Mr. Aslan's "ideas," if we may still call them like that. Being a non-believer myself but raised a Catholic in a religious school and with a deeply religious father, I have recently come across a Spanish Professor, Dr. Antonio Piñero, Professor Emeritus from Universidad Complutense de Madrid specialised in Greek Philology, who has dedicated some forty years of serious academic research to the Bible, to Judaism, and to the historical figure of Jesus. He has written extensively on all these subjects and has made a considerable effort to shed some light on them in many public appearances in lectures and radio programs. He has written almost 40 books and some of them have certainly been translated into English. This re-encounter with Jesus, even if I had not totally lost that contact, since religion is a subject that has always captivated me, has been very enriching because, among other things, has allowed me to re-examine some aspects of my upbringing and my knowledge of this figure and, also and most importantly, has given me the opportunity to get some insight on Judaism, which I knew very little about and which is proving to be such an immense and fruitful intellectual challenge. Prof. Piñero's analysis goes very much along the lines of what you have commented in this review. Leaving aside one's religious beliefs, or one's lack of it, offering such a simplistic, blatantly misinformed, one-sided vision of both Jesus and first century Judaism can only be proof not only of ignorance (that goes without saying) but, as you rightly point out, of a clear political agenda which reminds me of when Mr. Ahmadineyad pays lip service to appreciation of Jesus' figure just as his regime finances international terrorism... Thank God he appreciates Christianity. What if he hated it? Who the heck is Allan Nadler, and what are his credentials for writing this review? I want to know every single book he's ever written on Jewish topics - not just some of them, but ALL of them. You know, the same way he wants Aslan to list EVERY single book he's ever researched. That one ridiculous attack in the beginning made me stop reading the rest of the review. I disagree that Aslan's statement that his "research....[has made him] a more genuinely committed disciple of Jesus of Nazareth than I ever was of Jesus Christ" amounts to an "unsubtle suggestion that Evangelical Christians’ discipleship and knowledge of Jesus is inferior to his own." As a Muslim, he views Jesus as a man--a prophet of God, yes, but a man, Jesus of Nazareth, not as a messiah, much less the Christian divine Messiah. There are, in the review, plenty of good criticisms of Aslan without making up baloney like this. I have learned to view the Bible—by which I mean Christian Bible—as a record-of-sorts of a Tradition; I develop that idea in this eBook: https://www.academia.edu/13648715/Continuing_a_Tradition_NeWFism. This means that my only interest in the Bible is in the development of ideas that are evident in it—with purported historical information in the Bible of no interest to me whatsoever. Thus, I have no interest in a book such as this one! Like Dan Maguire, here in Milwaukee, I have utmost respect for Judaism, and I believe that many Jews would find the above eBook of great interest, because of its unique perspective. Also, this short paper (https://www.academia.edu/27101890/Justifying_NeWFism) has links to that eBook, along with 8 other ones. As a Christian, thank you for this response. It was intelligent, striking, and well thought out. A response that few could make. Mr. Aslan clearly has an agenda to support the ideals of the Islamic faith. He cloaks himself in the garbs of a scholar to justify his position. As you state in your closing paragraph, Jesus was not a man of violence, as was Mohammed. Mr. Aslan ignores the importance of FAITH, every passage of the Gospels can not be proven or refuted. That is the point of understanding our existence. Jesus asks for nothing less, but when given FAITH, provides GRACE. GRACE is the monumental answer to all of our questions. 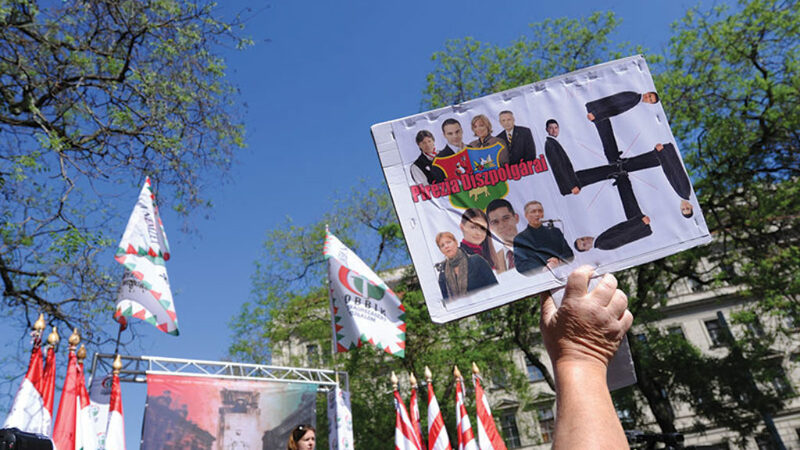 The End of Europe as We Know It? Why does Europe, the late 20th century’s greatest success story, now look so chaotic? In their dealings with Germany in the 1930s, were Hollywood’s moguls just watching the bottom line or aiding the Third Reich’s PR machine? Sigmund Freud loved Jewish jokes and for many years collected material for the study that would appear in 1905 as Jokes and Their Relation to the Unconscious. An excerpt from Ruth Wisse's new book No Joke: Making Jewish Humor. A new biography of Ezekiel Landau (the Noda Biyehudah) makes a controversial claim about his views on Kabbalah.